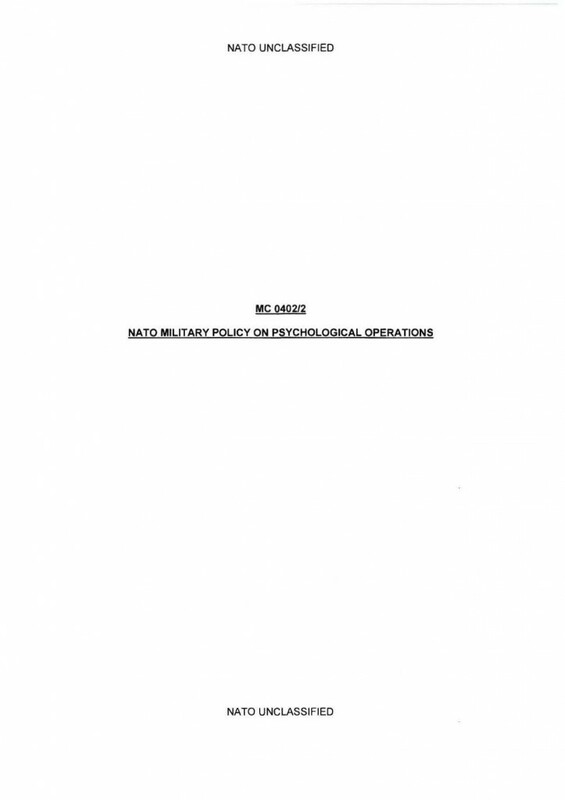 The following are two versions of NATO’s military policy on psychological operations. The most recent version from 2012 shows significant differences from the previous version from 2003, allowing for analysis of the evolution of NATO’s PSYOPS in recent years. Though unclassified, NATO doctrine documents like those below are not released to the public. 1. The role of Psychological Operations (PSYOPS) is to induce or reinforce the perceptions. attitudes and behaviour of North Atlantic Council (NAC) approved audiences in support of Alliance political and military objectives. Additionally, PSYOPS can mitigate the effective use of hostile propaganda against friendly forces, local civilian audiences and other audiences of importance to NATO. 2. The pervasive and ubiquitous nature of today’s global Information Environment (IE). including the importance of virtual and physical social networks and new media has increased the demand and importance of effective PSYOPS. This has been exacerbated by NATO’s involvement in Non-Article 5 Crisis Response Operations and information attacks against NATO and its member nations. In today’s IE, NATO can expect to operate for an extended period of time with limited resources in areas where sophisticated indigenous media, traditional communication and information from external sources compete to influence the perceptions of local audiences. The organisation, state, or entity more able to effectively and rapidly influence the understanding of a crisis or conflict, especially inducing or reinforcing the perceptions of particular influential audiences, will likely be the most successful. 3. PSYOPS are an indispensable part of the broad range of modern Military, Political, Economic, Civilian and Information (MPEC(I)) activities aimed at conflict prevention and crisis response. PSYOPS may multiply the effects of military capabilities by communicating messages directly through all available means, thus influencing the perceptions, attitudes and behaviour of their intended audiences. 4. The application of PSYOPS can have a significant impact in the long and short term to influence behaviour and act as a force multiplier and enabler to enhance NATO military capabilities. The principles of developing a PSYOPS plan apply across the full spectrum of operational themes (combat, security, and peace support) as discussed in AJP-1 and military activities (offensive, defensive, stability and enabling) as discussed in AJP-3. Although the complexity of the methodology varies with the audiences, basic considerations for the development of all PSYOPS actions are the same. 5. In order to preserve Alliance and PSYOPS credibility, PSYOPS are based on true and factual information, and are generally attributed to NATO or a concurring partner nation or organization.